Breathe easier after downloading this extensive pulmonary disease specialist directory from Bookyourdata.com! You’ll have all of the information you need to start networking with various lung doctors: emails, phone numbers, postal addresses, names, hospital information, and more. Look up experts in the pulmonary disease departments of clinics, hospitals, and organizations. Find those who treat complicated and common diseases, like COPD, lung cancer, asthma, and pneumonia. These dangerous and sometimes life-threatening diseases can have a severe impact on one's life, and pulmonary disease specialists need to quickly diagnose and treat these problems. The lungs are integral and sensitive organs, and these specialists know how to take care of them! Whether you're marketing an inhaler for asthma patients or a mechanical ventilation device, this is the list you need to let relevant specialists know about it. Pulmonologists are often interested in the newest and best way to treat and diagnose their patients, and if you have some kind of product or service that can help, then take the time to tell them over email, phone, or mail. 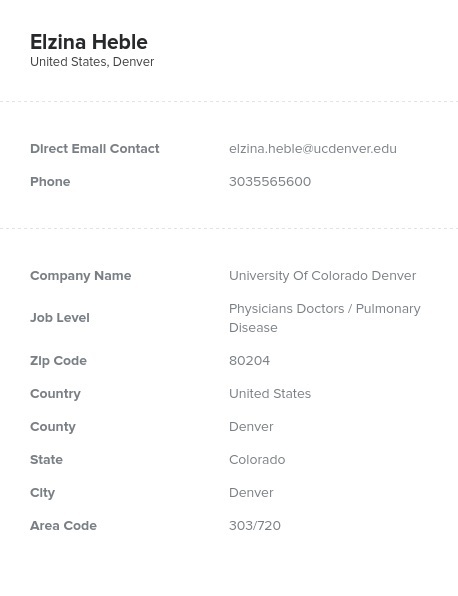 Communicating with a spread-out group of specialists is easier than ever with Bookyourdata.com because we organize and consolidate pulmonology specialists' contact information into one helpful and easy-to-use list. With Bookyourdata.com, pulling a wide array of specialists together into one database is as easy as inhaling and exhaling. With just a few clicks, you can get the information you need to boost your sales. Try it today!